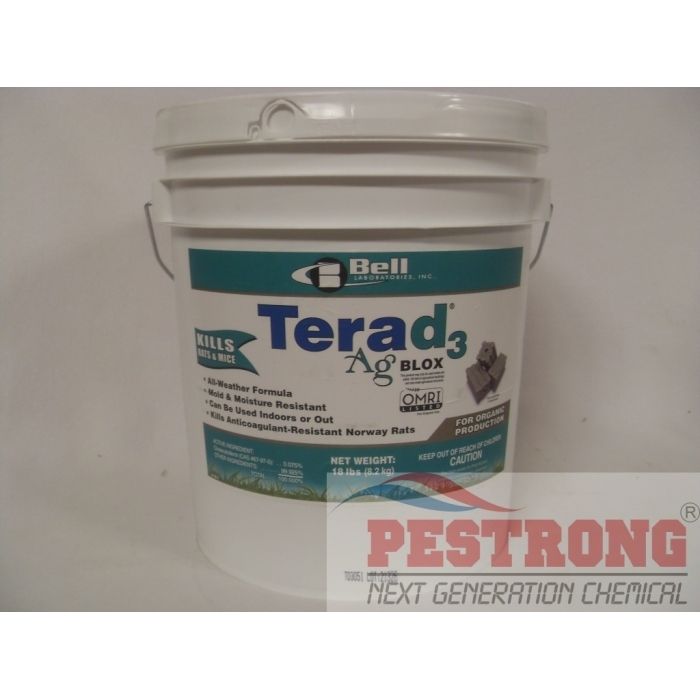 Where to Buy Terad3 Ag, Terad3 Ag Blox Rodenticide Organic - 18 lbs - $129.75 for Sale with Fast Free Shipping! Terad3 Ag Blox Rodenticide Organic - 18 lbs listed OMRI and EPA is unique bait gives PMPs access to a top quality rodenticide for organic facilities where previously no baiting options were available such facilities include dairy facilities, animal production, warehousing, storage and food processing. It can be used in and around agricultural buildings, including swine, poultry, cattle and dairy facilities. However, it cannot be used in the fields or orchards where crops are growing. Norway Rats and Roof Rats: Use 2 to 8 bait blocks per placement. Space placements at intervals of 15 to 30 feet in infested areas. Maintain an uninterrupted supply of fresh bait for 10 days or until there no longer are signs of recent feeding on bait by rats. House Mice: Use 1 bait block per placement. Space placements at intervals of 8 to 12 feet in infested areas. Two bait blocks per placement may be used at points of very high mouse activity. Maintain an uninterrupted supply of fresh bait for 15 days or until there no longer are signs of recent feeding on bait by house mice. FOLLOW-UP: Replace contaminated or spoiled bait immediately. Wearing gloves, collect and dispose of all dead, exposed animals and leftover bait. To prevent reinfestation, limit sources of rodent food, water, and harborage as much as possible. If reinfestation does occur, repeat treatment. Where a continuous source of infestation is present, establish permanent bait stations and replenish as needed. Terad3 Ag Blox Rodenticide Organic - 18 lbs can only be used to control Norway rats, roof rats and house mice in and within 100 feet of agricultural buildings and man-made agricultural structures constructed in a manner so as to be vulnerable to commensal rodent invasions and/or to harboring or attracting rodent infestations.Fence and perimeter baiting, beyond 100 feet from an agricultural structure as defined above, is prohibited. This product must not be applied directly to food or feed crops. Burrow baiting with Terad3 Ag Blox is prohibited. Bait stations are mandatory for outdoor, above-ground use. Tamper-resistant bait stations must be used if children, pets, non-target mammals, or birds may access the bait. Unique rodent bait for my property.